The Spectrasonics Stylus RMX Xpanded package includes the acclaimed Stylus RMX Realtime Groove Module virtual instrument software, plus all five of the award-winning S.A.G.E. Xpander expansion libraries: Backbeat, Retro Funk, Metamorphosis, Burning Grooves and Liquid Grooves. The Spectrasonics Stylus RMX Xpanded package offers a tremendous value - saving hundreds off the combined price of the individual titles. The addition of the Xpanders’ 5.5gb of outstanding acoustic drum and percussion grooves enhance Stylus RMX’s already massive 7.4gb remix-oriented core library. 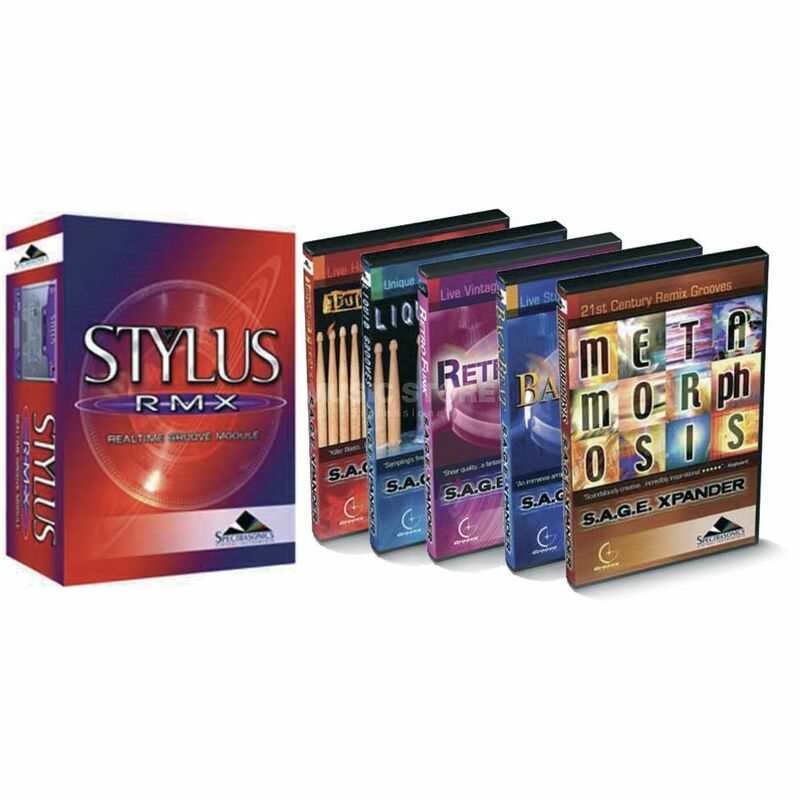 Since its introduction, Stylus RMX has become one of the most popular and widely-used virtual instruments in the world - offering a quick and easy way to creatively assemble incredible sounding grooves in all the popular host sequencers: including Apple Logic, Digidesign Pro Tools, MOTU Digital Performer, Steinberg Cubase, Ableton LIVE, Cakewalk Sonar and many others. Although the core library of Stylus RMX is focused on “remix” genres, the thousands of Xpander grooves that are included in the new package vastly broaden the musical scope of RMX by offering grooves and sounds for any style of music. A total of over 13 Gigabytes of massive sounds and grooves were produced by Eric Persing and feature numerous top session drummers including Abe Laboriel Jr, Gregg Bissonette, Bob Wilson, Eric Boseman and John Ferraro. They were recorded by Grammy-winning engineers at several legendary Hollywood studios. The wide range of tones and styles of the five Xpanders provide a versatile starting point for users to create authentic rhythm tracks. Stylus RMX is fully compatible with all current Mac OSX computers including Apples’ Intel Mac hardware, and also with all current Windows PCs including Vista. The Stylus RMX Xpanded package includes Stylus RMX and five SAGE Xpanders: BackBeat, Retro Funk, Metamorphosis, Liquid Grooves, Burning Grooves.